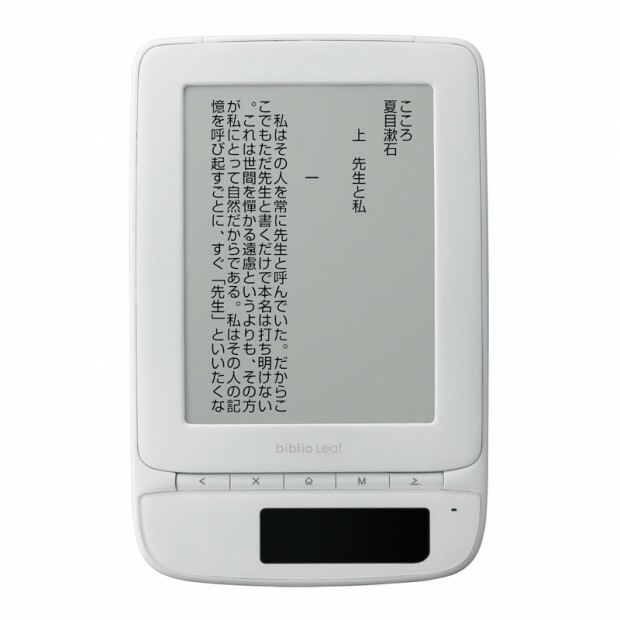 Toshiba and Japan’s second biggest mobile carrier KDDI announced [JP] the Biblio Leaf SP02 for the Japanese market yesterday, an e-reader that features a 6-inch monochrome screen (16 shades) with 800×600 resolution. The device has 3G and Wi-Fi connectivity and supports XMDF/PDF/EPUB files. Toshiba says buyers can expect a built-in calendar, a calculator and a notebook function. The Leaf’s internal memory (2GB) can be expanded via microSD cards (the device also features a microUSB port). What’s pretty interesting is the mini solar panel that’s built into the bottom right of the device. Toshiba doesn’t specify how powerful the panel will actually be but says that with the internal battery fully charged, users will be able to turn about 7,500 pages consecutively. The Leaf is sized at 198×130×9.6mm and weighs 295.8g. It will hit Japan in December with an open price model (there’s no word yet on international availability).